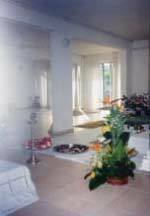 The Center Jaya of Yoga Vedanta has been created in 1990 in La Reunion on the initiative of two Yogacharias Jaya and Maheswari, them same formed directly by Swami Vishnu Devananda (direct disciple of Swami Sivananda from Rishikesh) and his disciple Swami Mahadev at the Ashram of Laurentides (Canada) in the years 1980 to 1984. They will teach yoga during several years in France, will work in Paris under the direction of Kaly, of Faek Biria, (disciple of BKS Iyengar) Jain Kirtiji, as well as the dancing Dervish Javad. They will also work during two years with BKS A. Iyengar in Rishikesh. 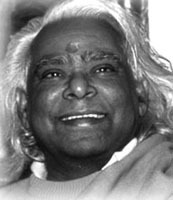 In the same way, they will work under the direction of their Master Sri Satchidananda of Madras. 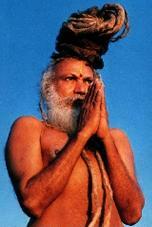 It was in 1989, during a yoga training in Paris, that they will meet Sri Sri Sri Satchidananda Yogi of Madras. This meeting will be determining in the engagements of their yogic asceticism and in the procedure henceforth as persons responsible of the Center Jaya. After several training with the master so much in Paris that in province, it is from their installation in La Réunion, that they will make several journeys to Madras to stay by Swami. They will invite the Master in La Réunion in 1995, 1998, 2001, 2004 in the pure Indian tradition, and the hundreds of their pupils from Reunion will come to receive his Darshan and to follow his teaching. Several conferences in the island, exchanges with the other local spiritual communities, Soufies, Christians, Indians, big ceremonies in Hindus temples will have grounds to welcome the Solar Yogi. Some training and yoga seminaries in pranic places in the mountains of La Réunion, Rituals and Offerings, local press and television delegations will mark the passage of Swami in the island as a respected spiritual and recognized personality. Jaya and Maheswari will organize in 1997, in the same way a journey with about twenty pupils from La Réunion, in Kanchipuram for a Sadhana under the direction of Swami. Disciples entirely vowed to his authority and the way of Yoga, they manage the Center Jaya in the ethics of this yoga of Madras. They are anxious to stay faithful to the tradition, making benefit their pupils of their experience by the Master, intensely physical experience but also spiritual. They regularly consult Swami for all downstream coming of him as for the projects of the Center Jaya and to instructions to take. They are besides thankful towards all encouragements that he lavishes them with the progression of their progress. They received Swamiji on May 2001 so that he dedicates the new places of the center. His last journey in May 2004 was a big success and the spiritual researchers of all horizons came very numerous to receive the blessing of this Master now hundred-year-old. It is while getting back entirely under the protection of their Master, that Jaya and Maheswari endeavored to develop in La Réunion a center of practice and radiance of the traditional yoga and teaching of Vedanta. They draw their teaching in the source of the Vedas, sacred science of the human wisdom but also with the numerous anecdotal and living lessons that the Master made them pass. If they had to summarize in a few simple words the size of his teaching, it would be in this sentence that himself pleased to say. "If you think that God is there, God is there, If you think that God is not there, God is not there." So such a teaching reveals the unsuspected strengths which allowed them often to raise some mountains, while making possible what didn’t seem being. To be close to Swami was a test of force and overtaking, because the Master thought and acted quickly. To want to approach a Sage requires to be able to answer his requirements. The renouncement of the ego, and the understanding of the service to the spiritual Guide are the basis rules for all learning of yogic knowledge. Strength and protection of the Master are the most precious goods for the spiritual researcher and the Sadhak. Now for both of them , to raise the challenge. Our Master. entered in maha-samadhi in September 2006. He left his physical body to join the plans of big yogis’ lineage which marked generations of candidates. We wish long life to his memory. May he always illuminates, more than ever, our steps on the way of the razor. May Gods bless him.